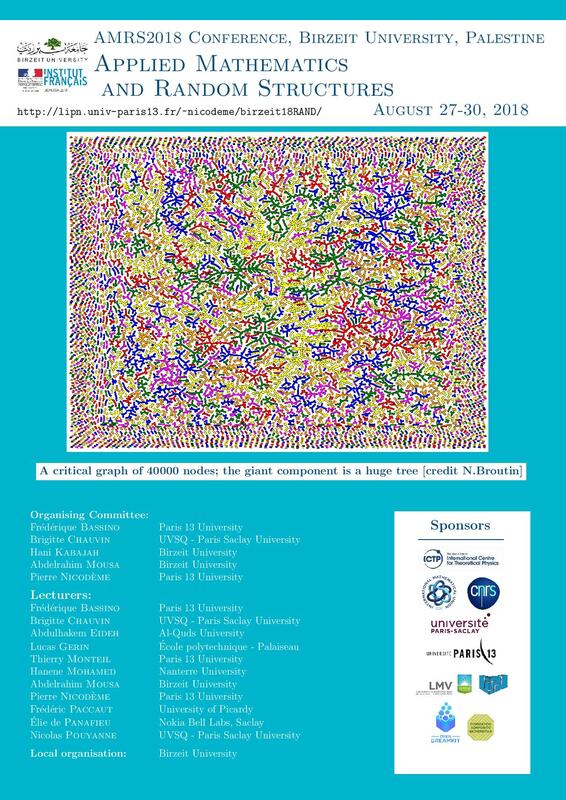 Birzeit 2018 Conference "Applied Mathematics and Random Structures"
in the Faculty of Science, Hall S240. Birzeit 2018 Conference is intended to foster future collaborations between Palestinian and French universities and research centers; enhancing collaborations with other European institutions is also hoped for. Birzeit 2018 Conference provides an opportunity for dissemination of important and recent results in the field of Applied Mathematics and Statistics with Applications to Economy, Industry and Science. Undergraduate Students, Master Students and Faculty Members are welcome to attend, interact, exchange ideas and discuss the trends and prospects of future research. The Program of the conference and the Summary of Talks are now available on the conference website. We look forward to welcoming you in Birzeit University.